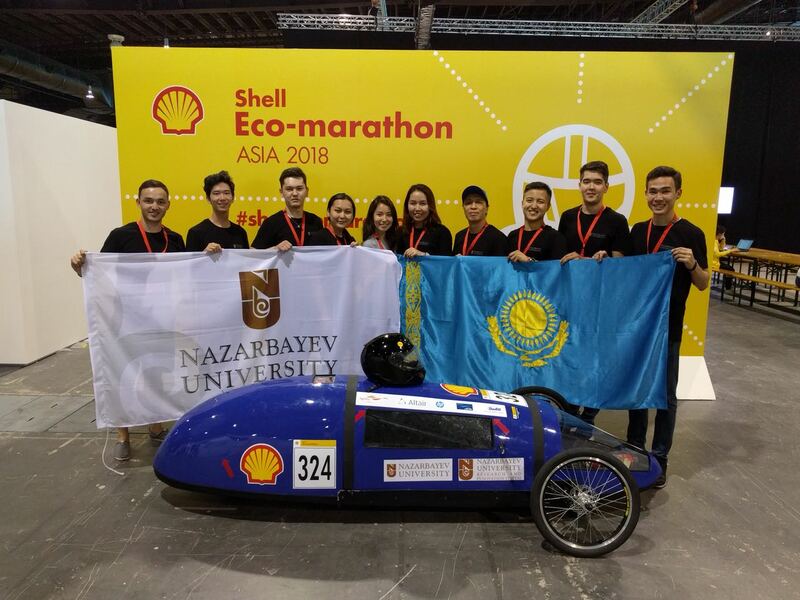 ASTANA – A team of nine undergraduate students from Nazarbayev University (NU) designed, constructed and drove a car on electric battery at Shell Eco-marathon Asia, held March 8-11 in Singapore. The team placed 13th of 26 in the electric car prototype category. Shell Eco-marathon is a student competition of energy-efficient cars held annually in Asia, Europe and America aimed at promoting sustainable transport. The winning team drives its car the farthest while consuming the smallest amount of energy. “We are happy with our results. First, before taking to the track we managed to go through technical inspection, the first round of competition. Around 87 percent of participants were allowed to proceed further. Later, as we joined the track, we achieved a valid run. In other words, we completed nine circles on the track within the time limit of 25 minutes. As a result, we were awarded 13th place in our category, which we believe is praiseworthy,” said driver Tamila Talasbayeva. The event attracted 122 teams from 18 countries competing with cars driving on electric batteries, hydrogen and internal combustion engines. Kazakhstan was also represented by a team from Satpayev University. “We heard about the competition for the first time from Young Zhao, a professor from the mechanical engineering department who suggested us joining the project last spring. 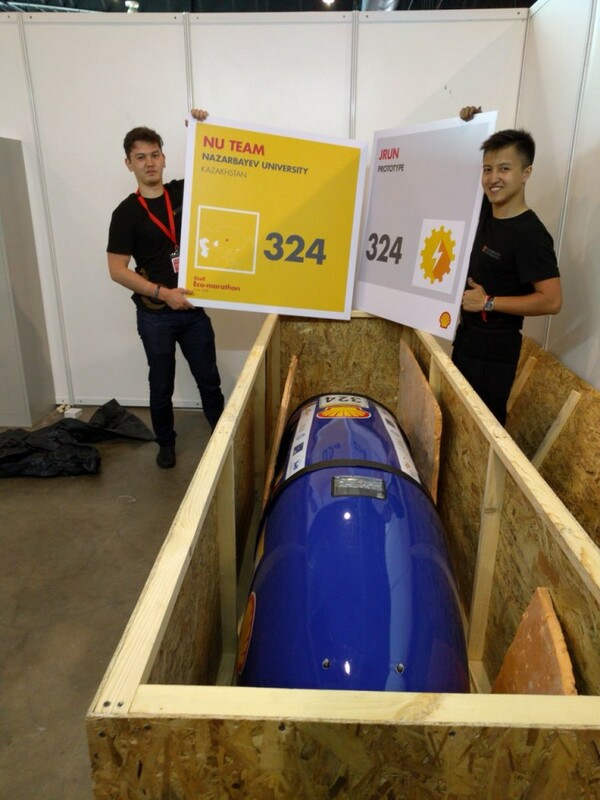 The ultimate decision to participate was made after Shell Kazakhstan agreed to finance the car’s construction,” said NU team member Raushan Utemuratova. The team was also supported by the university, its social development fund and the NU Research and Innovation System (NURIS). “We formed a team of nine students, with five students studying electric and mechanical engineering and one robotics student held primarily responsible for construction works. We also had an economics student responsible for PR and communications. Raushan and I are both studying civil engineering; however, while she took responsibility for project management, I was appointed as a driver,” added Talasbayeva. Eco-marathon organisers provided students with two books on prototype requirements, paying special attention to fire safety and proper brake functioning. “Our biggest challenge during preparation was time management, as we were falling behind the schedule. We had to finish working on some parts during the competition itself. Although there were several setbacks, overall, we did great,” said Utemuratova. “Another obstacle was that we lacked some parts during the contest, such as fire-resistant gloves and special liquid for brakes and batteries, which we had to search for in Singapore,” noted Talasbayeva. 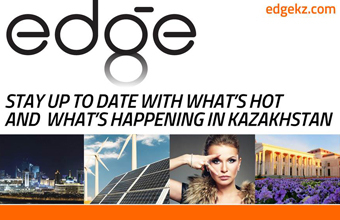 “Although the contest has been around for more than 80 years, Kazakhstan was represented for the first time. Some participants did not know much about our country, so we believe we created a positive image. Moreover, we proved that our university and students are highly competitive,” she added. The project allowed participants to learn to work in teams, manage their time, practice communication skills and develop personally. Utemuratova plans to continue her studies at Columbia University, then return to Kazakhstan to facilitate industrial development. The project also helped Talasbayeva choose to study sustainability upon graduation.